If you’ve ever come face-to-face with water gushing out of your water hoses, pipes, or faucets, you know what kind of horrifying and frustrating damage severely high water pressure can do to your RV. Getting the best RV water pressure regulator is considered a necessity in the life of an RVer. Renator M11-0660R Water Pressure Regulator Valve. What’s the Big Deal About Water Pressure Regulators? Water pressure regulators are designed to regulate the PSI of the water coming out of a spigot. They keep the out-flow safe and consistent to ensure your plumbing is protected. Some places have been reported to produce water pressure up 120 PSI. This kind of pressure will tear your rig’s plumbing and give you extensive damage repair costs. The purpose of water pressure regulators is to protect your RV’s plumbing from being utterly destroyed by these unreliable campsite water pressures. It’s a little investment that can potentially save you extensive amounts of money. Prior to hooking up your RV, you can use a water pressure gauge to determine how much water pressure is coming out of your water supply. You want the pressure to be consistently between 40-60 PSI. If the PSI level is considerably higher, then YES!!! It’s strongly advised for you to attach a water pressure regulator. You may be new to RVs or you may have been one of the lucky ones SO FAR who’ve been spared the devastating results of 120 PSI! If you frequently hook up to various water sources, I highly recommend one of these little investments to keep your future free of disappointing damage. How Much Pressure Should You Let Through? Factories usually set their regulators at a default level of approximately 45 PSI. Most homes are designed for 40-60 PSI. Some of the newer RVs are able to stand up to 80 PSI. Anything higher than 80 PSI is considered dangerous for your RV Water hose, pipes, faucets, and even your washing machine. To be on the safe side, it’s recommended to keep the pressure around 50 PSI for a water flow that resembles your shower flow at home. See below for some Water Pressure Tips and Tricks. It’s not all about safety for your plumbing. In some cases you want to consider how much water is in your water heater. A higher pressure will produce a higher flow rate and deplete your hot water supply faster than you had anticipated. If you need to be efficient with your water supply, you may want to consider using a lower setting for a slower flow in order to save water. Click here to read about how a water pressure regulator can help you save energy. Some water pressure regulators are simple brass or stainless steel devices that you attach to any standard garden hose and spigot fittings. These are fixed units that regulate water pressure at the default setting. They may be simple, but many of these certainly do the trick. A couple downsides of these regulators are that you can’t see or adjust the PSI levels. Other water pressure regulators come with a gauge that allows you to see how much water pressure is coming through the water line. You can adjust these with a screwdriver and set the water pressure at your desired PSI level. With advanced technology and added benefits come more parts. These regulators with gauges pose the possibility of higher maintenance. In all cases, you can choose to go with a fixed water pressure regulator at a low cost to see if it suits your needs; or you can opt to go for a higher investment for the convenience of a gauge and adjustability. Let’s have a look at some options! This durable, lead-free pressure gauge is a new and improved version with a 1-year warranty. This quality product maintains a high flow rate of 6.51 GPM while controlling water pressure at a desired level. It’s manufactured with an all-time low lead content rate of less than .13% which make this safe to use with your drinking water. The convenient gauge is constructed with oil to keep the internal components working with longer life expectancy. The water pressure regulator can easily be adjusted with a screwdriver up 160 PSI. It features both female and male fittings that have standard ¾ in water hose threads and NH threads which makes this an ideal choice for all American water sources. It’s advised to refrain from using this device in frigid environments. This inexpensive little brass water pressure regulator is designed to keep your water pressure at a fixed level of 40-50 PSI. At this setting, it keeps the water pressure consistent and your RV’s plumbing and hoses safe. CSA low lead content certified, this unit is safe to use with your drinking water. The standard ¾ in fittings are compatible with US water sources and standard garden hose threads. Another lead-free brass water pressure regulator, this unit is safe to use with your drinking water. The attached gauge conveniently shows the PSI levels of the water source. The oil in the gauge prolongs the life of the inner components. The water pressure can be adjusted up to 160 PSI by using a screwdriver. The ¾ in garden hose threads and NH threads fit with all standard garden hoses and US water sources. Designed with durability, they are engineered to prevent water leakage. Another unique feature is the explosion-proof plug. It prevents water from spraying out of the hose when the water pressure goes above its designed capacity. Additionally, this regulator features a dual-layer inlet screened filter. This allows for the unit to be spared from damage or blockage caused by gravel or other debris. This lead-free water pressure regulator by US Solid is manufactured well under low-lead requirements for safe and healthy water. It regulates water pressure to a consistent and safe pressure level and still allows for a great water flow. By using the attached gauge, you can see the current PSI levels and adjust them from 0-160 PSI with a screwdriver. The ¾ in NH threads are compatible with all US water sources. The fittings have a quality, thick design that prevent leakage. The inlet screened filter keeps gravel and debris from blocking or damaging the regulator. This water pressure regulator’s tough and solid build is designed to last without leaking. It fits standard hose fittings. It keeps water pressure at a fixed setting of 50-55 PSI, which is still well in the range that keeps your plumbing safe. Higher than the average 45 PSI setting, this is designed for the water systems in the newer RVs. Along with the higher pressure setting, it features a wide mouth which allows for the RV’s showers, toilets, and sinks to function with a 15-20% higher flow than the previously mentioned regulators allow. This flow rate gives you the comforts of home while you’re on the road. This unit includes a built-in stainless steel filter screen to keep debris out of the regulator. If you’re looking for a simple fix and some peace of mind when you’re hooking up to a water source, you may want to go with the Camco Model #40055. It’s highly affordable and yet it’s designed to still maintain a safe and desirable pressure level. You may want a higher flow rate to give you a comfortable shower likened to home. If your RV can stand higher levels of PSI, choosing the Valterra may be a great option for you. Many RVers want to be able to monitor the pressure levels and adjust the PSI settings. If that’s you, the Renator M11-0660R may be just what you’re looking for. It has a quality build and a pleasantly high flow rate of over 6 GPM. Sometimes the little things in life get ignored until the pressure gets too high and the lid blows off. I wouldn’t want that to be the case for your RV. Choose your water pressure regulator before your water system caves under the pressure of an unpredictably high water source. Also check out our post on the Best RV Water Pump. 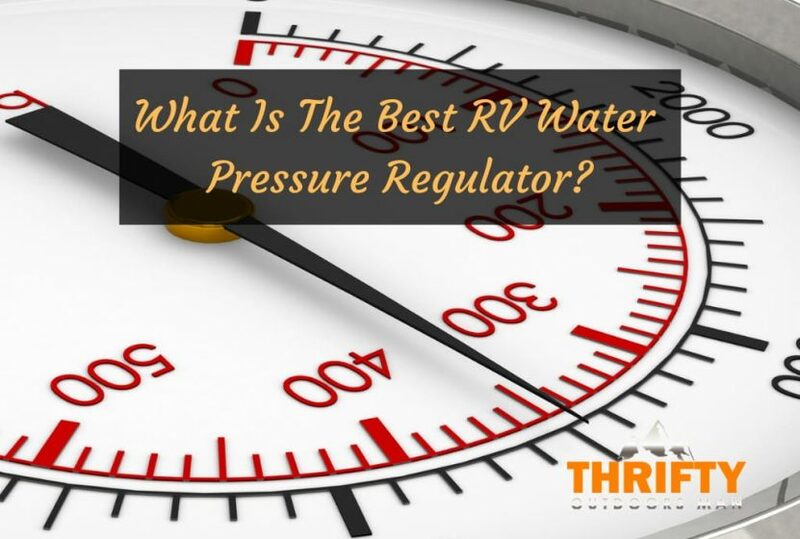 » RV Camping » What Is The Best RV Water Pressure Regulator?